Each box is made using Baltic Birch wood that is hand sanded and finished with New Wave's proprietary wood finish for maximum durability. The finish is non-porous, dense, and resistant to water as well as standard artist solvents and mediums. In addition, the finish is crack proof, chip proof, and non-yellowing. Stainless steel and aluminum accents provide strength where needed most. All hardware is non-corrosive. Friction hinges allow for sturdy 180° range of motion. 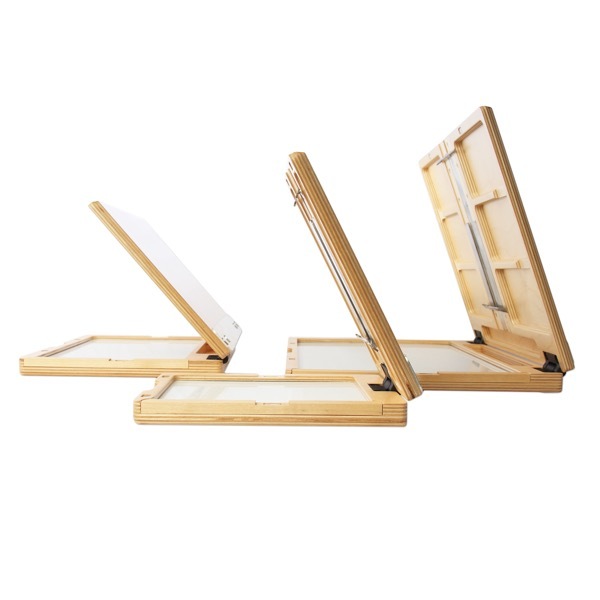 Strong rare earth magnets are used for the closure, panel/canvas holder, removable side wall for palette cleaning/replacement, and accessory side tray attachment. All of the boxes can be attached to a universal ¼" tripod mount. Teeth on the stainless steel panel holders are capable of holding panels as thin as 1/16" and stretched canvas up to 3/4" thick. A high density plastic palette is included. Oil paints can be removed with solvents, and dry acrylic paint peels off. A tempered glass upgrade is available for the Large box in grey or clear. The Small measures 6" × 8" × 1¼" and weighs 1.35 lbs. with palette included. The maximum painting surface is 9" vertical. The Medium measures 8.4" × 11¼" × 1¼" and weighs 2.1 lbs. with palette included. The maximum painting surface is 10" vertical. Contains a recessed storage compartment at the rear of the palette measuring approximately 6.19" × 1.12" and 0.88" in depth with a closed lid. Can be used to hold paint brushes, paint tubes, wet paint dabs, etc. The Large measures 11" × 14½" × 1¼" and weighs t 3.15 lbs. with palette included. The maximum painting surface is 14" vertical. Contains a recessed storage compartment at the rear of the palette measuring approximately 9½" × 1.12" and 0.88" in depth with a closed lid. Can be used to hold paint brushes, paint tubes, wet paint dabs, etc. Side trays and additional items are also available. All of the boxes are made in Pennsylvania.